THERE was nothing specific for the tech ecosystem in the Budget 2014 proposal announced by Malaysian Prime Minister Najib Razak on Oct 25, beyond the promise of strengthening broadband connectivity in the country and the continued focus on supporting entrepreneurship in general. The RM50-million (US$15.8-million) allocation to establish the Malaysian Global Innovation and Creativity Centre (MaGIC), a one-stop centre to empower entrepreneurs, looks promising. MaGIC, which Najib first announced at the Global Entrepreneurship Summit (GES 2013) on Oct 11, will monitor the performance of entrepreneurs; house an integrated database as well as incubators; assist with the patenting of intellectual property; provide funding facilities and a business-matching process. It will also guide, counsel and train entrepreneurs – all under one roof. MaGIC will sit under the National Entrepreneur Development Office, a new unit that will be established under the National Strategy Unit of the Ministry of Finance, which will plan and coordinate all activities related to entrepreneurship. With the intention to make Malaysia “an Entrepreneurial Nation,” a programme called 1Malaysia Entrepreneurs (1Met) was implemented to expose entrepreneurship to youth interested in venturing into business. The target is to train 5,000 young entrepreneurs yearly, with MaGIC playing a key role, Najib said. As is usual with budget announcements, initial information is sketchy at best, and it will be up to the bureaucrats to fill in the details in the coming months. But the key message here is that the support of entrepreneurship is front and centre for the Malaysian Government, and that is great news for the ecosystem. Telekom Malaysia group chief executive officer Zamzamzairani Mohd Isa (pic), in lauding Budget 2014, said that his company is already working closely with the Multimedia Development Corporation (MDeC) and StartupMalaysia.org in introducing the first corporate accelerator programme in Malaysia. This programme would “help accelerate the growth trajectory of high potential digital entrepreneur startup companies to tap global demand with innovative products and services,” he said in a statement. “With MaGIC, Malaysian entrepreneurs in industries such as creative multimedia, R&D, outsourcing and data management will have easy access to various facilities including funding, incubation, and mentoring – all under one roof,” said MDeC chief executive officer Badlisham Ghazali. “As for talent and training, we are pleased with the incentives given under Budget 2014 for companies which cover partial operational cost for human capital development in R&D. This will help spur innovation amongst companies and entrepreneurs,” he added. The connectivity that urbanites take for granted will also be enhanced and rolled out to suburban and rural areas in the coming year. If the experience of urban areas is anything to go by, this will mean more Malaysians coming online and wanting to consume more broadband-enabled services such as e-commerce. It will also open up avenues for more Malaysians to become entrepreneurs, building businesses around the Internet. “This is definitely a boon to the e-commerce industry in Malaysia, as it will encourage and enable more people to have seamless access to the Internet,” said Masaya Ueno, Rakuten Malaysia president and CEO. “In turn, this will drive greater value creations from the increased connections, capitalising on e-commerce as an enabler while allowing the sector to thrive and grow, through its widespread reach across the country. “Robust nationwide Internet access and strong support for the business community, combined with positive developments around mobile shopping, social shopping and e-wallet, will continue to make Malaysia a vibrant and profitable market for e-commerce,” Ueno (pic) added. Specifically, the Government will implement the second phase of the High-Speed Broadband (HSBB) project in collaboration with the private sector, involving an investment of RM1.8 billion (US$570 million). The initiative is expected to provide additional coverage mainly in urban areas, benefiting 2.8 million households nationwide. The Internet speed will be increased to 10 Mbps. The HSBB network will be expanded to suburban areas with access of between 4Mps and 10Mbps, which will benefit two million consumers at a cost of RM1.6 billion (US$507 million). To increase Internet coverage in rural areas, 1,000 telecommunication transmission towers will be built over the next three years, with an investment of RM1.5 billion (US$475 million). To increase Internet access in Sabah and Sarawak, new underwater cables will be laid within three years, at a cost of RM850 million (US$269.4 million). These investments will utilise the Universal Services Provision Fund, which is under the purview of the Malaysian Communications and Multimedia Commission. 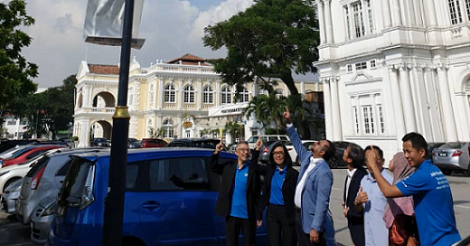 “This is a big boost for Digital Malaysia and will serve as a very important catalyst to drive us towards a ‘digital economy’,” said MDeC’s Badlisham (pic). “The more people and businesses get on-line, the quicker we as a country can drive our levels of production, efficiency and ultimately improve the quality of life of our citizens,” he added. Telekom Malaysia’s Zamzamzairani said that when it comes to underserved areas, the company will continue to strengthen its fixed line services while exploring other alternative technologies. “The establishment of the submarine cable network to serve the bandwidth capacity requirements of Internet users in Sabah and Sarawak is much welcome in anticipation of increasing future capacity requirements and ever-growing data needs,” he said. “It is envisaged that there will be tremendous growth of data over the next few years and it is in tandem with an increasingly dynamic and high growth business environment in Malaysia, tied with the exponential rise in Internet usage,” he added. The National ICT Association also lauded the widening of high-speed broadband coverage in the country, while pointing out that this would promote a ‘digital economy’ and lifestyle for Malaysians, especially those in rural areas of Sabah and Sarawak. However, its chairman Woon Tai Hai sounded a note of concern on the overall communications cost as compared with some of Malaysia’s regional neighbours. Indeed, while mention was made of increasing broadband speeds to 10Mbps (the lowest speeds under Telekom Malaysia Bhd’s UniFi service is currently 5Mbps), it was glaring that the cost of this upgrade was not mentioned, meaning it will be left to the profit-oriented Telekom Malaysia. “However, 10mbps for the urban areas is rather low as the Internet consumption of our urban population is closer to a developed country, whereby the minimum offering of 50 Mbps is common and 10 Mbps is no longer sufficient to meet the demands of urbanites,” he added. Point: Time to get on with IT, men!